Our colleagues from Army Recognition reported that Russia is developing a new self-propelled coastal defense gun, based on the 2S35 Koalitsiya-SV system. The announcement came from Burevestnik Design Bureau chief, Georgy Zakamennykh. The Russian naval command plans to outline the technical characteristics of the new system within the next two months. 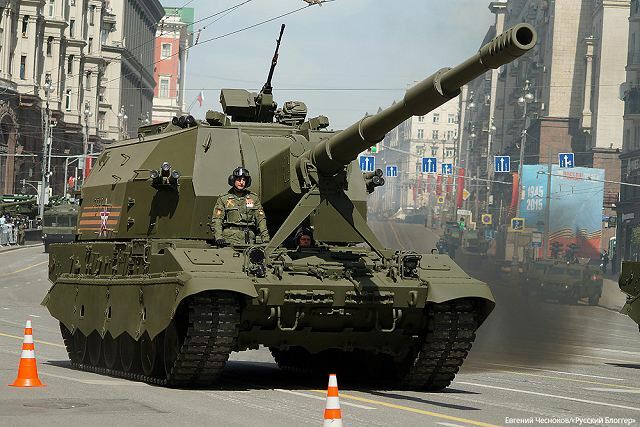 Russian-made 2S35 Koalitsiya-SV 152mm self-propelled howitzer at military parade in Moscow. 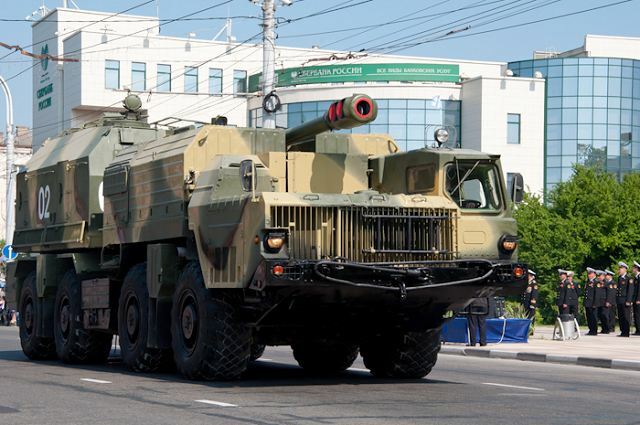 “We have always favored unification because it is cheaper… The knowhow obtained during the design of the 2S35 Koalitsiya-SV gun can come in very handy in the development of the new coastal defense artillery systems,” Zakamennykh told RIA Novosti news agency. Russia’s naval commander, Admiral Viktor Chirkov earlier announced a planned switch to coastal defense artillery systems of the type used by the ground forces. The new systems will be an upgrade of the existing ones and adjusted for use by the Russian Navy, the Admiral added. The 2S35 Koalitsiya-SV self-propelled howitzer was presented for the first time to the public in April 2015 during rehearsals for the Moscow Victory Day parade. The 2S35 can fire fully autonomously without any crew in the turret. The first batch of 12 2S35 152mm self-propelled howitzers was delivered to the armed forces in March 2015. According to Russian military engineers, the new 2S35 can used high-explosive long-range precision-guided munitions with a maximum range of 70 km and high level of accuracy. Standard equipment of the 2S35 Koalitsiya-SV includes NBC protection system, night vision, computerized fire control and screens for each members of the crew to control firing operations. Currently, Russian armed forces uses the Bereg, a 130mm self-propelled coastal defense gun system. A turret with a 130mm gun is mounted on an 8x8 truck chassis MAZ-543M . The Bereg 130mm is designed to engage surface ships during anti-amphibious fleet operations. The vehicle enters in service with the Russian armed forces in 2003. The gun is fitted with a semi-automatic loading system which able the Bereg to fire 10 rounds per minute. The Bereg 130mm has a maximum firing range of 22 km and carries a total of 40 rounds.